Liz's Paper Loft: MCT September Release Sneak Peek Day 3 ~ thankful! MCT September Release Sneak Peek Day 3 ~ thankful! Woot Woot it's Day 3 of My Creative Time September Release Sneak Peeks! Hasn't this week been AWESOME so far! Well I promise you will not be disappointed with today's projects either. Today is all about the belly band...do you even know what that is? :) Well it's a band that wraps around something that can usually slide off. I thought it would be fun to add the belly band to my card, but I also wanted the card to look pretty without the belly band too. So I decided to stamp the sentiment twice. There was a lot of making to create the layers of leaves and acorns. After the stamped images were dry, I water colored them. Beautiful cards! Love the colors! I love how you decorated the band with the leaves to match the card front! Wonderful! Liz, your cards are amazing! From the stamping to the water coloring, this is genuinely amazing! Thank you for sharing this with us! I am grateful to have had the opportunity to check out all the amazing talent this DT has. Liz, Your card with band is Beautiful! Thanks for sharing! Oh WOW Miss Liz Your card is so Gorgeous!! Love the colors you did a fabulous stamping and coloring job...WOW!! I so love your clever and creative idea for the belly band and then stamping the sentiment too on the card...definitely you did a super outstanding creative job. I can't wait to get this new set. YOU ROCK!! Wow Liz.. what a gorgeous card! Love the fall colors and the gorgeous sentiment but it all looks stunning with that belly band! Lovely! TFS! This is so sweet and so clever! I love how the sentiment is revealed when you remove the band. Stunning card and a stunning band to match! Love your watercoloring and the gorgeous colors! Wonderful card! I like that you also stamped the belly band to make it more interesting and to blend in with the rest of the card. How pretty! This is so getting me in the mood for fall! What a fun release. Can't wait to get my hands on it!!! Wow! I adore this card you made. It is beautiful. I love the fall colors, the sweet sentiment, and the beautiful card with or without the band! You did an amazing job! 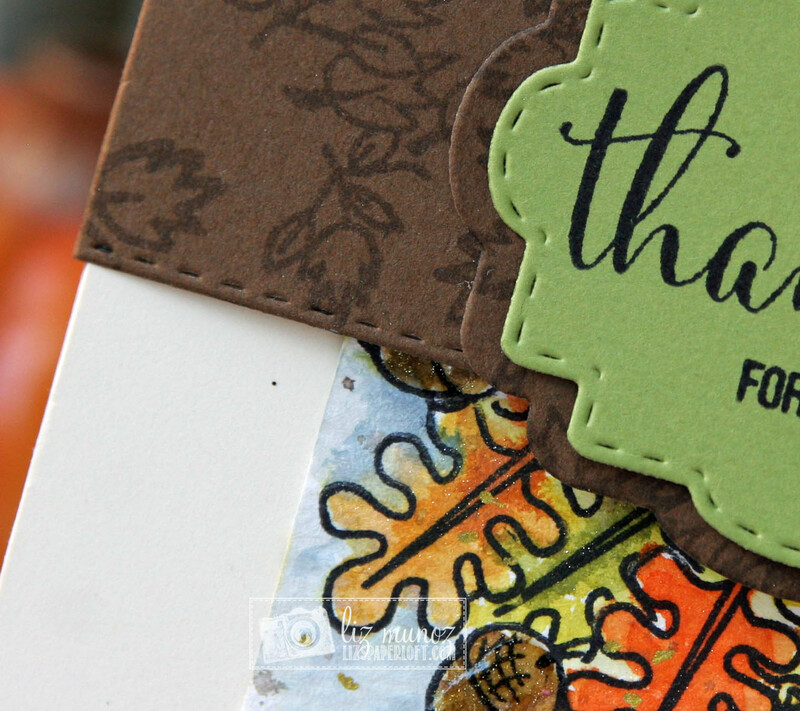 The leafy layers are beautiful and I like the sentiment stamped on and behind the belly band. Such a fabulous job stamping, inking and coloring. Love the leaves stamped on the band too. Very pretty fall color, love all the colors that you chose. Great Job!!! What beautiful fall cards. Great new set of dies and stamps. Wow, gorgeous cards. The belly band works perfectly on your card and the colors are so beautiful. Love this new release. i love your card! the colors are amazing and it is so unique! cszekeres at hotmail dot com. I love your beautiful fall card both with and without the bellyband. Your leaves and acorn clusters are stunning, but the addition of the belly band certainly escalates the impact. I've completely 'fallen' for your card and this new release! Gorgeous! Very pretty for Fall. I like that you stamped the sentiment twice. Liz, camouflaging your card is genius!!!! How beautiful is this? Girl you have got it going on with this set. I'd love to receive that as a gift. Gorgeous project Liz! I just LOVE your watercoloring!!! Gorgeous card Liz! I Love the watercoloring and the stamping on the belly band is fabulous! Super pretty card design! Love the release! GORGEOUS!! I mean GORGEOUS!! I LOVE how you masked the leaves, the whole background is AMAZING then to lift the belly band ~ again CLEVER!! Beautifully done!